Scottish tunes and songs to celebrate Robert Burns's 250th birthday played on pipes, fiddle, harp, guitar, cello, voice, flutes and oboe. 10. Will Ye Go to the Indies, My Mary? 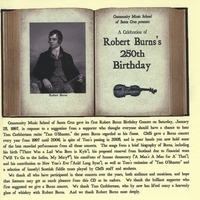 Community Music School of Santa Cruz gave its first Robert Burns Birthday Concert on Saturday, January 25, 1997, in response to a suggestion from a supporter who thought everyone should have a chance to hear Tom Cuthbertson recite “Tam O’Shanter,” the poem Burns regarded as his finest. CMS gave a Burns concert every year from 1997 until 2006, in spite of Tom’s passing in 2005, and in your hands you now hold some of the best recorded performances from all those concerts. The songs form a brief biography of Burns, including his birth (“There Was a Lad Was Born in Kyle”), his proposed removal from Scotland due to financial woes (“Will Ye Go to the Indies, My Mary?”), his manifesto of human democracy (“A Man’s A Man for A’ That”), and his contribution to New Year’s Eve (“Auld Lang Syne”), as well as Tom’s recitation of “Tam O’Shanter” and a selection of (mostly) Scottish fiddle tunes played by CMS staff and students. We thank all who have participated in these concerts over the years, both audience and musicians, and hope that listeners may get as much pleasure from this CD as its makers. We thank the brilliant supporter who first suggested we give a Burns concert. We thank Tom Cuthbertson, who by now has lifted many a heavenly glass of whiskey with Robert Burns. And we thank Robert Burns most deeply. Cal Celt: Jesse Autumn, harp; David Brewer, pipes and whistle; George Grasso, flute and banjo; Theo Paige, fiddle; Daniel Roberts, fiddle; Emily Swanson, fiddle; Linnaea Wilson, fiddle.